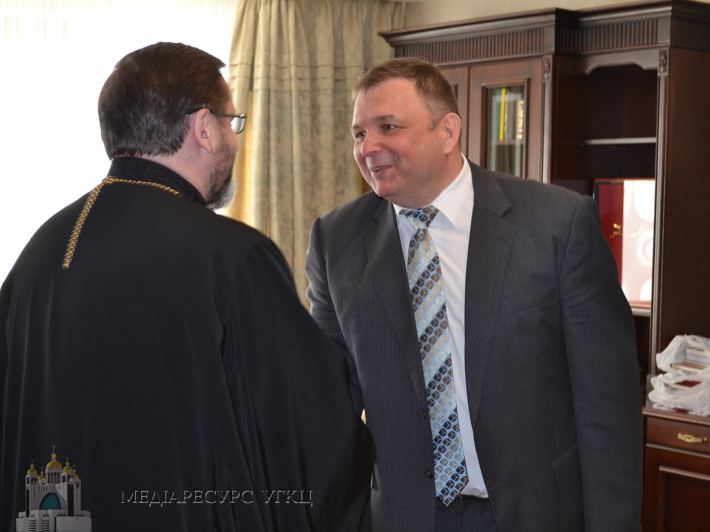 On April 16 in the residence of Head of UGCC, located near the Patriarchal cathedral of Resurrection of Christ in Kyiv, was held a meeting of His Beatitude Sviatoslav with Head of Constitutional Court of Ukraine Stanislav Shevchuk and members of his family, judge of Constitutional Court of Ukraine Vasyl Lemak. During the meeting His Beatitude Sviatoslav shared the view of Catholic Church regarding the problem of establishing justice in our country, which is interrelated with the position adopted by joint religious community of Ukraine – All-Ukrainian Council of Churches and RO, expressed with the following statement: “Our people are thirsty for justice, and whether authority does not provide them with it, people will search for justice using another ways, dangerous even to such extent as illegal use of force, what our enemies are already ready to take on their account”, mentioned Head of UGCC. The next point Head of UGCC willed to discuss was related to a protection of the right of free speech, peaceful gatherings, religion, social morality and traditional family values of Ukrainian people. Distinctly, he paid his attention to the violation of Article 51 of Constitution of Ukraine, emerging from attempts to implement gender ideology in our country. Head of Constitutional Court of Ukraine assured that them will firmly hold on to the position of primacy of law, respect to the spirit and letter of the Major Law, based on the natural law. He also told about the recent all-society’s positive resolution on peaceful religious gatherings, where he personally was a judge who reported on it. During the conversation His Beatitude Sviatoslav, appealing to the Major Law of Ukraine and new history classes, explained high-ranking guests that Constitutional Court holds in its hands the future of Ukraine, and we all together need to realize this responsibility. It’ll be extremely actual during the forthcoming running election polls. The Head of Constitutional Court in response to these marking words said that they are aware of this responsibility, as well as a fact that God never gives us a burden we cannot bear, Lord holds everything in His hands. At the end, His Beatitude Sviatoslav wished all guests well, blessing them for a responsible and not easy service at the Court, so they carry their noble titles, being addressed with the words “Your Honor” in the name of God and people.